Warm orange and cool blue in this planner sticker kit create an attractive contrast that you’ll love to use in your every day scheduling. Use the full boxes to make notes and lists that will be there when you need them. 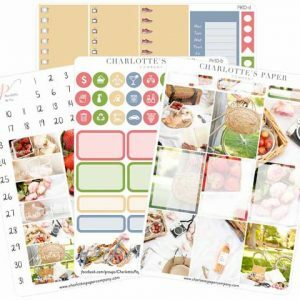 Customize your calendar with date covers and functional stickers that remind you about trash day, movie night and everything in between at a quick glance. This kit is gorgeous. I love the orange and teal combination. Very bold and unique color choices. Charlotte’s attention to detail is perfect and a nice mix of deco and functional stickers.